Purchasing a simple thing like paper towels may seem like a no-brainer, but take a moment to think twice about this product. It gets used every day by almost every person in your organization – which means you go through a lot of it very quickly. As such, you need to select paper towels that are efficient and economical and that serve your organization well. Center pull paper towels are a waste of money. What’s the best paper towel to choose for cost-savings? 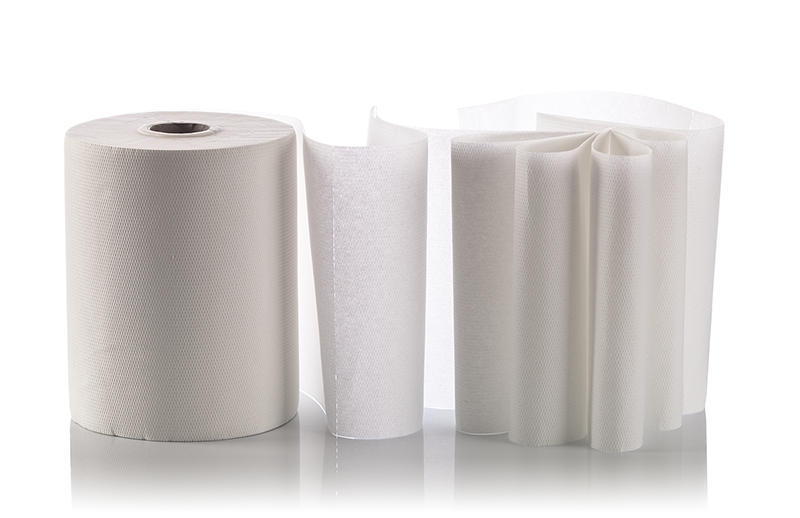 With the many options available for paper towels, which is the best one for your organization? Which is the most efficient? Which will your consumers prefer? And, most importantly, which will offer you the best cost-savings? There is one kind of paper towel that meets all of the criteria: controlled hard wound paper towels. There’s no waste. Unlike many other kinds of paper towels, controlled hard wound paper towels are not dispensed too quickly. This helps people to “portion control” (i.e. they take no more product than they need) and, thus, greatly reduces the amount of unnecessary waste. The whole roll gets used. Another one of the chief benefits of controlled hard wound paper towels is that you can be sure you’re getting your money’s worth. Other kinds of paper towels leave wasted product behind when the dispenser is almost empty. But with controlled hard wound paper towels, the whole of roll is used before it gets changed out. It has an effective dispenser. The controlled hard wound paper towel dispenser dispenses each paper towel in a flat position. Because the towel doesn’t need to be unfolded, there is more available surface area for people to dry their hands. As a result, each person uses less product. Are you using center pull paper towels? If you are, did you know that center pull paper towels are a waste of money? The biggest reason center pull paper towels are a waste of money is that, with this kind of paper towel, people simply use much more product than they need. This happens for a couple of different reasons. For one, center pull paper towels are just not effective. Because they are wound so tightly together (and, thus, have a reduced available surface area and drying potential), they cannot dry your hands as quickly as other styles of paper towels. As a result, people often end up using many more towels than they need, wasting product and, ultimately, money. Also, with center pull paper towels, roping is a common problem. Roping occurs when the paper towels do not perforate as they should. Instead, they become connected in a long string so that people pull much more from the dispenser than they truly need. Finally, center pull paper towels are particularly ineffective for the childcare industry. The very design of the dispenser (in which one “pulls” a paper towel hanging from the center of the dispenser) can be fun for kids to use. Unfortunately, this means that lots of little kids will pull an excess of paper towels just because it’s fun. It’s clear that center pull paper towels are not the most economical choice for your organization. Fortunately, there are many different types of paper towels and dispensers to consider. When it comes to folded towels, there are a couple of different varieties. And while they can all look a little similar, there are distinct differences. C-fold: C-fold paper towels look most similar to multi-fold paper towels. Their key difference is that they are folded differently. Quite simply, c-fold paper towels are folded in the shape of a “c” so that, when stacked, they lie flush against one another. Multi-fold: Multi-fold paper towels are folded in three layers, almost in the shape of a “z.” When stacked in a dispenser, they interlock with each other. Although similar, multi-fold paper towels are generally larger and more absorbent than c-fold paper towels, so you use less product. Single-fold: Single-fold paper towels are folded in half in one simple “single fold.” While c-fold and multi-fold paper towels can share a common dispenser, single-fold paper towels require a different kind. They can also be loaded into a pop-up box like that of facial tissues. Folded towels can be an attractive choice for several reasons. They are strong, thick, and absorbent. And due to the simple design of their dispenser, they can be a good choice for high-traffic, public bathrooms. Unfortunately, folded paper towels are not the most economical choice. For one, because of the ease with which they are dispensed, people often grab these towels carelessly in large handfuls. Moreover, people rarely bother to unfold the folded paper towels before drying their hands, thus, wasting product by not taking advantage of its full surface area. As the name implies, you’ll find kitchen roll paper towels most commonly in the kitchen. These are the large, fluffy paper towels that so attractively clean up spilled juice in the television commercials. But, like almost all other kinds of paper towels, kitchen roll paper towels have their advantages and disadvantages. The good: Kitchen roll paper towels are strong and absorbent and are able to withstand large messes. They are also very soft (which is why they are the most attractive choice for use in one’s home). Also, while kitchen roll paper towels are large and absorbent, they are not easily dispensed in a public setting. Thus, people tend to be wasteful and grab a large handful of them – not a very economical choice. In an effort to avoid the inefficiencies of paper towels, some organizations will turn to jet air dryers as an alternative. But, like the many styles of paper towels, these electric dryers have their own pros and cons. The good: Without considering the energy it takes to operate jet air dryers, these machines produce less waste than paper towels. They can also make for a cleaner public bathroom as there will be no overflowing trashcan of used towels. The bad: Despite these appeals, at the end of the day, most people prefer to dry their hands with some form of a towel rather than an air dryer (which many regard as simply annoying to use). Also, it is a common misconception that jet air dryers are more sanitary than paper towels. In fact, research shows that paper towels actually decrease germs found on fingertips by up to 77%. What kind of paper towel is your organization currently using? If you’re looking for a paper towel that can get the job done the most efficiently and that will offer you the best cost-savings, then controlled hard wound paper towels are your best choice. To make the switch to controlled hard wound paper towels is easy. Our janitorial vendors can remove your current dispenser and install the new one for you. Even better, this exchange costs little to nothing. If you’re already enjoying using controlled hard wound paper towels for your organization, you can now continue to use your favorite product at a less expensive price. Order through one of our janitorial vendors and receive the discounted Food & Supply Service pricing. A simple product like paper towels may not garner that much attention, but remember: what you purchase matters. Reduce inefficiencies and save money by choosing to purchase your products through a Food & Supply Service vendor. Become a member of Food & Supply Source today – it’s free! Find out how much you can save by completing our Cost Analysis Request form. Already a member? Sign in and place and Order Now.